A long established but still ongoing project, to produce a pack of playing cards such as might have been used during the English Civil War. It’s been a very long journey so far to recreate such an ephemeral item. What I don’t know is – a lot more than I do know. So here in the picture we have a shot of a sheet of court cards – the Kings, Queens and Knaves (the term Jack came in later) and the pattern is called Rouen II. Most of the cards in England in the 16th century were imported from the French town of Rouen. Each manufacturing area at this time had a couple of distinct local patterns – Paris, Lyons, Guyenne, for example. In 1628 Charles I banned the importation of cards from France, and the manufacture of playing cards was placed under the control of a London company which is still around today. 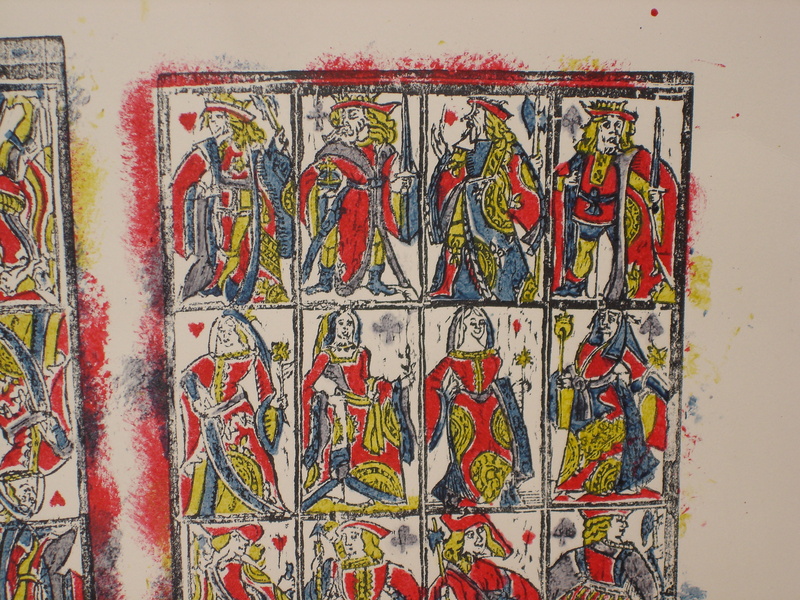 From here on, it’s thought, the journey of English playing card design began, from the detailed woodcarvings of French artisans to the strangely stunted and abstract designs that we know today. The process was aided and abetted by the rough hands of English copyists, for whom getting the stuff out on sale was more important than artistic accuracy. Anyway, what you have in the picture is a sheet after it’s been coloured with four separate stencils, but before it is finished and cut. I’ve tried to mirror the process as well as I can, but one thing that does need improvement is the paper. I used Fabriano Rosaspina which is a rag paper well suited to printmaking, but I believe from some sources that the card should be made up of several sheets of paper, glued together with a black sheet at its core for opacity, very important in gambling when perhaps huge sums may depend on the turn of the cards.